“We had the idea for this elevator display last year, after the election, when the words “fake news” started dominating the conversation. It seemed like an opportunity to remind people that librarians are experts in evaluating information and of the importance of using critical thinking whether you’re choosing sources for a research paper or deciding whether to share a certain post on social media. 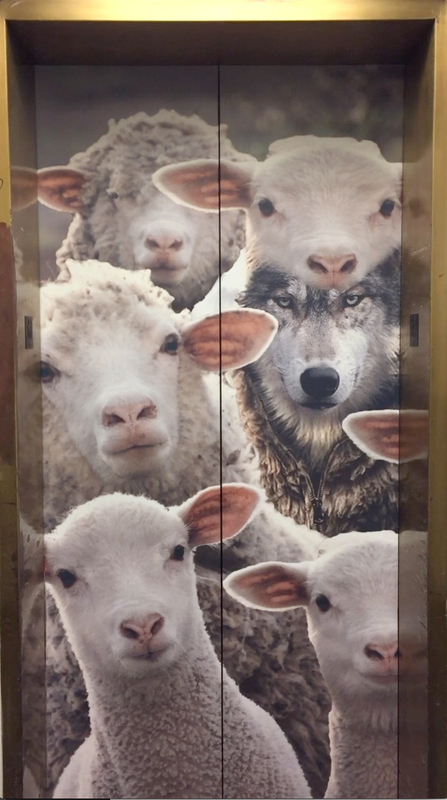 Below: video shows the opening for two elevator doors, the “wolf in sheep’s clothing” door pictured above, and a second door which reads “don’t fall for fake” upon opening.